An underwater birthday celebration at Nusa Dua, Bali! Day two in Bali was our 34th Birthday!! 20/12/2014. It marked the 12th year I celebrated my birthday with my better half, Alhamdulillah. After a romantic breakfast by the pool, consist of muesli & pastries (as the American or Indonesian breakfast set was not halal), we had a quick swim at our private pool & then off to Nusa Dua. We left the villa at 8.30am, and the traffic was quite clear. We took the new highway which was build on the sea, and it took us less than half an hour to reach Nusa Dua. Nusa Dua will spoil you for the choice of water sports activities. Amongst the activities available were parasailing (which I didn't have the guts to try! ), snorkeling, scuba diving (you don't need a licence to do this in Bali), banana boat, Flying Fish, jet ski , sea walker and turtle island visit. The prices were in USD,and it ranged from USD35 to USD 60 per activity per person, and the price will be cheaper if you choose 3 activities. I chosed Flying Fish, Sea Walker & a Turtle Island visit, and hubby said it'll be my birthday present from him so YIPPIE! It cost us Rp 3,345,00 (RM935) for the 3 activities for the 2 of us. I know, the Flying Fish was a bit of a rip off, but the sea walking was totally worth it! Oh, that price include rental of an underwater camera and a diving suit rental as well. We changed to our diving suit and put everything in a locker & walked to the beach. Next we were taken by a boat to the coral area for our sea walking experience. We were given diving shoes to avoid getting cuts, then a belt with stones were put around our waist to weigh us down. As we slowly decent into the water, a large helmet not unlike those worn by the astronauts were put on our heads. Oxygen supply was being given via a pipeline on top of the helmet. As we decent onto the sea bed, the instructor held me & asked me to hold on to the railing built in the seabed, while waiting for my hubby to decent. The experience was totally AWESOME! I was literally screaming in awe & I kept saying "Subhanallah" (Glory be to Allah). We were given bread slices in plastic bags, and as we opened the plastic bags, school of fish of beautiful colours and shapes started to eat from our hands, literally! Oh my it was an experience money can't buy. The instructor with his diving suit had our camera so he snapped away our photos as we feed the fish. We even saw nemo fishes amongst the anemone... So cute!!! After the sea walking trip, we went back to the shore, got our diving suit off, have a shower & changed to our normal clothes. The diving suit was quite tight fittings so I wore my skirt on top of it, so it was wet. After the shower, the only clean and dry pants I had was my swimming pants! We tried looking for a shop selling long skirts, but there was none around. All shops sold bikinis, swimming suits & shorts only, to suit the majority of the tourists. The turtle island trip was a short trip by a boat, took us about 10 minutes to reach the small island. As we reached to island, a local lady was assigned to us to show us around & helped us take photos. There were 2 areas, one are the small pools for smaller, cuter turtles, and a large "pool" which was actually part of the sea being fenced, to house bigger turtles. The oldest turtle was 40 years old. It was my first time seeing and holding turtle in my hands & I can't stop thinking how the kids would love it to be there. Besides turtles, there were a few other animals including snakes, birds and bats.I took a chance & held the snake but eewwww it was gross & scary!! From Nusa Dua, we went for lunch in a halal Nasi Padang Restaurant nearby. The choice of food was abundant & they are all super tasty! It cost us Rp155,500 (RM 43) and the restaurant had a praying room too, so it was great. We did our Zuhr & Asr jamak prayers and continued our journey. At noon, we reached Pantai Pendawa. The sand was super white & the sea was blue, with a lot of children cooling themselves in the sea. It was so beautiful, we didn't think Bali would have such a place. 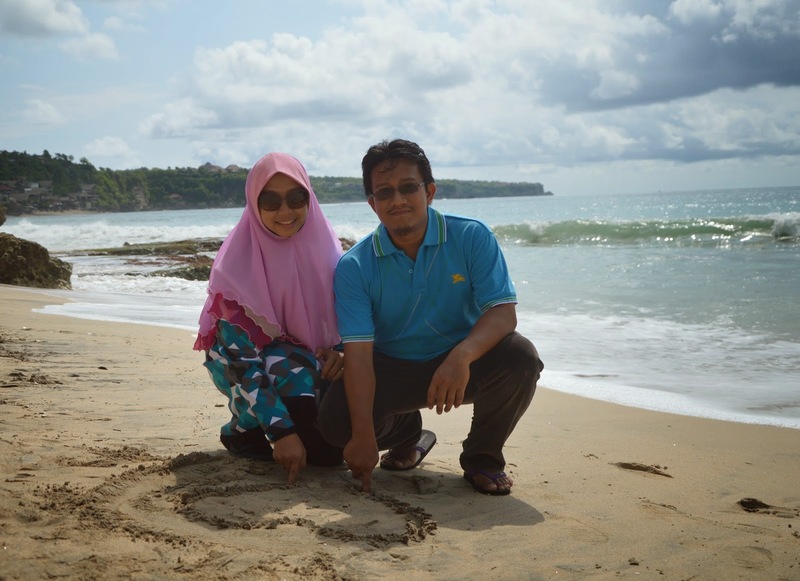 From Pantai Pendawa, we headed to Dream Land Beach at Pecatu area. We had to pay Rp10,000 (RM2.80) for entrance fees, and our driver dropped us at a "station" where a van will take us to the seashore. The beach was not as beautiful as Pendawa Beach & it was cloudy so we did not stay long. Dream Land Beach, part of Tomy Suharto's property. Uluwatu Temple is situated at Badung area at Pecatu, and the view was breathtaking. Although it was drizzling, we had a good time & took a lot of photos. The cliffs reminded me of Cliff of Moher in Ireland. The yellow clothes was made compulsory to be worn while at the temple ground. From Uluwatu, we went to Kuta Beach area to go to the famous Hard Rock Cafe Hotel and shop. The beach itself was crowded with local tourists particularly school students. The wind was strong & red flags was put up, signaling that it was dangerous to be in water. After a short stop at Kuta beach, we we did more souvenir shopping at Krishna Bali & then headed on for dinner at a halal restaurant called the Nasi Tempong shop (Jalan Dewi Sri No 788, Seminyak). They served nasi ayam penyet with the best herbs I have ever tasted. At Rp125,000 price tag for 3 people, it was totally awesome. We reached home at 8pm, tired to the bones, but ready for tomorrow's adventure in nature at Ubud & Kintamani.